Celebrate the Solstice With IPS Solar! 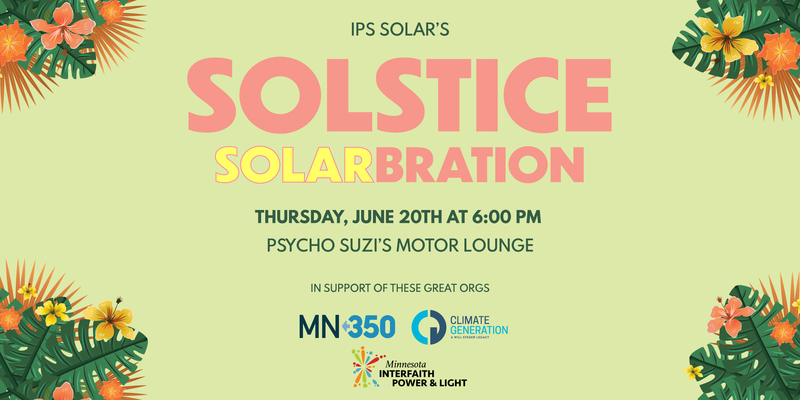 IPS Solar is throwing a Solstice Solarbration & Community Fundraiser at Psycho Suzi’s Motor Lounge! Join us as we celebrate the longest day of the year and support several amazing nonprofits! The evening will include a tasty family style buffet, Psycho Suzi’s famous tropical drinks, festive music, games, fabulous raffle prizes and an unparalleled view of the Mississippi River from Suzi’s private waterfront balcony. – a night full of fun and adventure! Proceeds from the event will be supporting the work of several amazing nonprofits. MN350: MN350 unites Minnesotans as part of a global movement to end the pollution damaging our climate, speed the transition to clean energy, and create a just and healthy future for all. With the imagination and dedication of thousands of volunteers and working in coalition with organizations statewide, MN350 is making Minnesota a leader in the transition to a just and livable clean energy economy. MN350 uses a full range of peaceful methods, including policy advocacy, bold public events, political engagement and nonviolent direct action to change the rules of government and corporate behavior. Climate Generation: A Will Steger Legacy: Climate Generation was founded by polar explorer, Will Steger, based on his powerful eyewitness to climate change from over 50 years exploring the Polar Regions. We recognize the power of eyewitness accounts and personal story, acknowledging that as our world warms, we all have a climate story to tell. Our programs work to realize our vision: a world of resilient communities with equitable solutions to climate change and our mission to empower individuals and their communities to engage in solutions to climate change. We provide educators, youth, policymakers, communities, and business leaders with the resources and opportunities to engage in solutions to climate change. Across these audiences, our programs work to build climate literacy, develop powerful climate advocates, and elevate leadership. Each year we reach 5,000 educators, 3,500 youth, and thousands of people through our public engagement. Minnesota Interfaith Power & Light: MNIPL is an interfaith community co-creating a just and sustainable world. They work in partnership with faith communities to build transformative power and bring the lights of people’s unique gifts to addressing the climate crisis. They do this in two ways: leadership development programs and action opportunities that provide tangible ways to make an impact. MNIPL believes that it’s not enough to offer people opportunities to take action on the issues they care about. Instead, they believe leadership development and organizing training empower individuals to build a movement capable of creating a just and livable climate for the human and more than human world. This entry was posted in Events, IPS Solar, Solar Industry and tagged Climate Generation, Event, Fundraiser, IPS Solar, MN350, MNIPL, Psycho Suzi's, Solarbration, Solstice on April 10, 2019 by Kyle Wehnes.